: Anna Samsonova. Revised by Renée Sporre-Willes / Original version (EN). 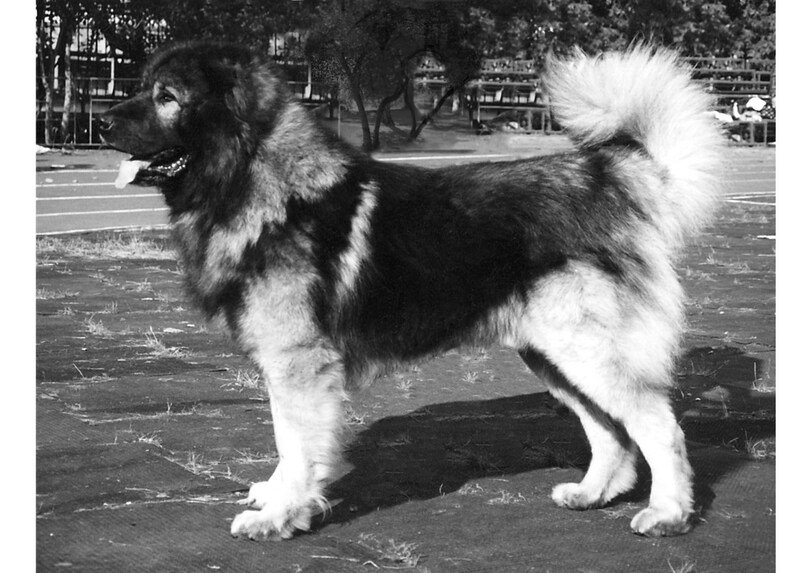 : The Caucasian Shepherd Dog (CSD) is considered to be the breed taking its origin from ancient Caucasian dogs. : The Caucasian Shepherd Dog is a harmonious built, large, strong dog with plenty of bone and powerful muscular system; of a slight rectangular format. : The body length exceeds the height at withers by 3-8 %. The length of the forelegs averages 50-52% of the height at the withers. The length of the skull correlates with the length of the muzzle as 32.
: Behaviour is steady, active, self-confident, fearless and independent. The Caucasian Shepherd Dog shows a devoted attachment to its master; it is an excellent guard dog. : The head is large, massive, and broad in cheekbones; when viewed from above the head looks like a wedge with broad base. : Massive and broad; forehead is almost flat, with a marked but not deep furrow. Superciliary ridges are developed, but not protruding. Occipital bone inconspicuous. : Noticeable but not clearly marked. : Black, large, with correct open nostrils, not proceeding the muzzle outline. A black nose in solid, spotted or piebald colours is desirable but not obligatory (but genetic blue or liverbrown nose is not allowed). : Broad and deep, gradually tapering towards the nose; with strong jaws and chin; great depth and is well filled under the eyes. The bridge of the nose is broad. The upper lines of the muzzle and skull run parallel. : Thick, close-fitting, well pigmented. : Teeth should be healthy, white, strong; incisors are close to each other and in one line. Complete scissor or pincer bite (i.e.42 teeth). : Well developed and emphasized by well pronounced chewing muscles. : Moderate size, oval in shape, not too deep set, wide and obliquely placed. The colour is different shades of brown from dark to hazelnut. Eyelids are black, dry and close-fitting. Expression is serious, attentive and inquisitive. : Moderate size, thick, triangular shape naturally pendant, high and wide set. Inner part of ear is close lying to the cheeks. Ears are traditionally cropped in country of origin. Natural ears are of equal value. : Of medium length, powerful, low set; rounded in the cross-section. Crest is pronounced especially in males. : Very well developed in all dimensions; broad, well-muscled and well balanced. : Well pronounced, moderately long. The height at the withers slightly exceeds the height over the rump. : Short, broad, slightly arched. : Moderately long, broad, rounded, slightly sloping to root of the tail. : Long, broad, well ribbed up, deep in general as well as in its frontal part; in cross-section has broad-oval shape. Ribs well sprung, false ribs are long. The forechest is marked. : Belly moderately tucked up towards rear. : Set on high, sickle curve or curled. In repose hanging down reaching the hocks; when the dog is alert, tail can be carried above the backline. : Well muscled. Viewed from the front, straight, parallel forelegs that are set fairly wide apart. : Strongly muscled. Moderately long, broad, slanting to form an angle of approximately 100 degrees with the upper arm. The shoulder-blade lies close against the chest. : Strong and muscular, close fitting. : Placed strictly back in parallel axis; turning neither in not out. : Straight, massive, moderately long, well muscled; rounded in cross-section. : Short, massive; almost straight viewed from the front and the side. : Large, rounded in shape, well arched, well-knit. : Viewed from the rear straight, standing parallel and moderately wide. The stifles and hocks sufficiently well angulated when viewed from the side. The hindquarters should not be set too far back. : Broad, well muscled, moderately long. : Broad and lean, sufficiently well bent; firm, turning neither in nor out. : Not long, massive; almost straight viewed from the front and the side. : Free, elastic, unhurried movement with good driving power in the hindquarters. Good stability in all joints and with good co-ordination. The trot tends to be the typical movement. The withers are on the same level as the rump, and the backline is relatively stable during movement. : Thick, sufficiently elastic, without any folds and wrinkles. : Straight, coarse, stand-off coat with well developed undercoat. The length of guard coat as well as the undercoat should not be less than 5 cm. The coat on the head and forelegs is shorter and thicker. The tail is completely covered with dense coat and looks thick and furry. The longer outer coat forms “brushes” on the ears, a “mane” around the neck and “trousers” on the back sides of the thighs. : Any solid colour, piebald or spotted colour. Except for solid black; diluted black or black in any combination or genetic blue or liver brown colour. Too light or too coarse in built. Deviations in the sexual dimorphism. Head small in proportions to the body; light; narrow; long; coarse; blocky or apple head. Muzzle downfaced; dishfaced or snipy. Teeth too small; widely spaced; incisors not set in one line; any deviation from the dental formula (except for absence of the PM1s). Eyes large; bulging; very light; showing haw; slack eye lids. Ears large; thin or set too low. Top line roach or sway back; long, sagging or arched loin; rump higher than the withers. Body square; too cobby; too long; narrow in both front and rear; too leggy; chest very short, flat or shallow; croup short or steep. Weak bone; muscles and ligaments in joints. Lack of driving power in the hindquarters. Coat that is very soft; curly; has very short guard coat or no undercoat. Any deviation from the required bite. Incompleted dental formula (absence of any tooth except the third molars (M3) or the first premolars (PM1s). Wall eyes; deep blue; green shaded or eyes of different colour. Constant pacing or impossibility to assess the gate. Black colour in any variation; solid; diluted; piebald, spotted or as saddle (except for mask). Genetic blue colour in any variation or nuance. Bluish-grey pigmented nose, lips and eye rims. Genetic brown colour in any variation or nuance. Genetic brown nose, lips and eye rims. Tan-marking in black, blue or brown dogs. Severe deviations in the sexual dimorphism in males.